Lawn Care Business Book. Order today. Available in kindle format here. When I first got my business started, I didn’t really know anyone who was an entrepreneur. I had no one I could bounce ideas off of or compare my crazy stories with. For all I knew at the time, I was the only one who ran into problems with my business. Later when I got the Gopher Lawn Care Business Forum started, I began to realize that everyone who runs their own business, has issues they have to deal with. Whether they are business, personal, family, mental, financial, medical, or whatever. This book takes a look at the issues business owners have to deal with. It shines a light on topics not often talked about. As you read this book, you will learn about issues you can outright avoid, issues you can try your best to avoid, and issues that will just sneak up on you. Once they happen, you will learn the best ways to minimize their damage so you can move forwards quicker. Ultimately you will learn crazy things happen to all entrepreneurs. If you find yourself dealing with some heavy issues, you are not alone. I wish there was a book like this to read when I was getting started, so I didn’t feel so alone and lost, worrying if I had what it takes to make it. Wasting my time worrying was time I could have spent being more productive. So my message to you is, don’t sweat the small stuff. Crazy things will happen. Read this book, learn what to watch out for, and be more productive. - Customer problems. Watch out for these customer warning signs. - Equipment issues. - Theft! Learn how others got their equipment stolen! Could you ever imagine it happening at a red light? - Money. - Estimating jobs and underbidding them. - Personal problems. Your wife wants a vacation! - Labor problems. How to find good help. - Disasters. What to do when you break a customer’s window. - On the job injuries. You won’t believe how many business owners get carpal tunnel syndrome. 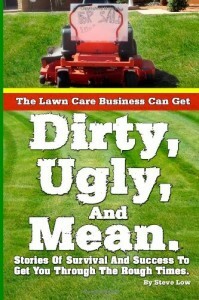 You can order this lawn care business book here. If you would like to read more about how to improve your lawn care or landscaping business, check out my many lawn care business books on the topic. Visit my Gopher Lawn Care Business Forum at http://www.gopherforum.com and watch my GopherHaul Lawn Care Business Videos and Podcasts across the internet and on my GopherHaul Lawn Care Business & Marketing Blog at http://www.lawnchat.com. Don’t forget to try out our Gopher Lawn Care Business Software too at http://www.gophersoftware.com By Steve Low Host of The GopherHaul Lawn Care Business Show and the Gopher Lawn Care Business Forum.